I was one one of Uber’s best fans – I must have recruited a dozen friends and colleagues to the service, because it fundamentally is just so much better than taxis or car services. Wonderfully inspired idea, and at the street level, brilliantly executed. I loved it. And I use the past tense because I did love it. But not anymore. The trickle of moral lapses by Uber’s CEO, Travis Kalanick, have become a roaring torrent. 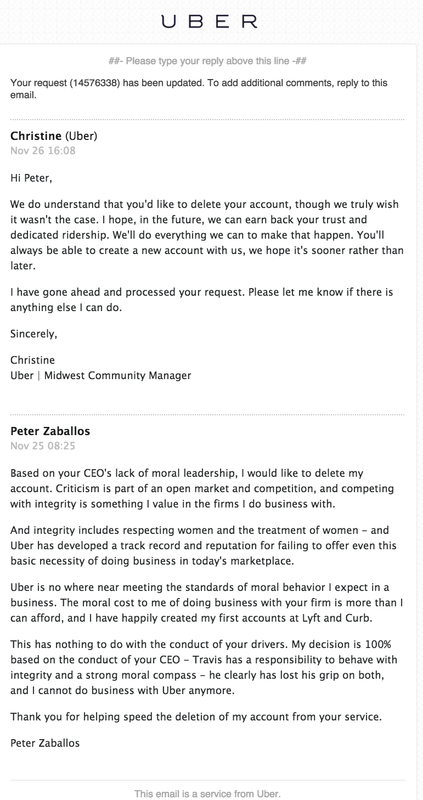 Uber has an ethics problem, but most importantly it has an ethical leadership problem. And in efficient Uber fashion, I received this confirmation of my account cancellation, which is sad. The service and drivers are great. But that’s not enough today. You have to believe in and trust the people at the top. And I can do neither with Uber the way it is being run right now. Travis – until you show some leadership and I won’t be back.